You might think Disney's Animal Kingdom Park is just a place to see exotic animals like tigers and elephants, ride thrilling attractions like Flight of Passage, and feel like you've been transported to Africa. You'd be right, but the park also features some of Disney's best snacks, including jungle juice slushies, Dole Whips with rum, and chocolate doughnut holes. 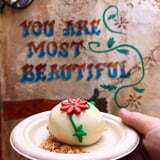 Now a new snack has appeared in the park, and it's modeled after one of Disney's most photographed places - a floral wall with an old-timey look called "The You Are Most Beautiful Wall." We're going wild! 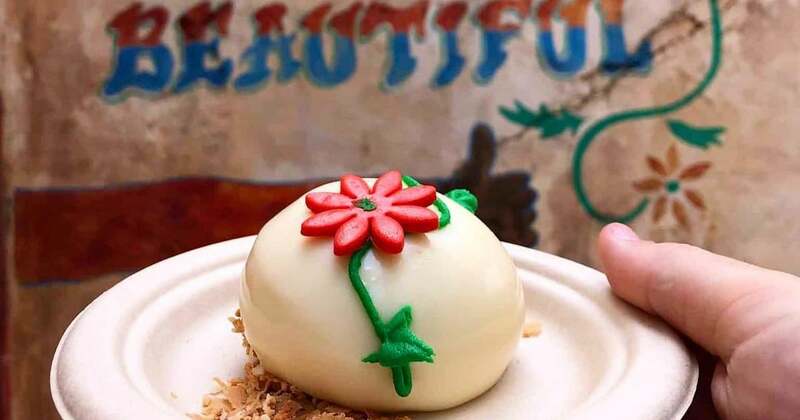 The Most Beautiful Cake, served cold and made of coconut mousse with pineapple cake and coconut flakes, can be found at Harambe Market, which is, of course, also where the wall is, so you can easily take a photo of the cake with its inspiration. The refreshing dessert, featuring a flower motif just like the wall, is $5 and available on Mobile Order - but probably not for long. We have a feeling this item is a limited edition, so hurry!